New England's largest transportation center is Logan International Airport. Logan Airport is located a convenient two miles from the city center. 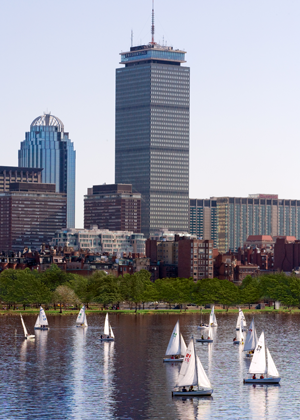 Most Boston and Cambridge hotels are within a five-mile drive. The City’s subway system provides access via the Silver Line at South Station to all terminals at the airport, and the Logan Express bus offers an inexpensive service from the Back Bay’s Copley Square and the Hynes Convention Center to all terminals as well. Massport provides complimentary shuttle bus service between airline terminals and the Airport Station on the MBTA Blue Line. Traveler Tip: Loganwifi is free and available throughout the airport and charging stations are built into many seating areas. Amtrak is a passenger rail service that connects Boston, New York, Washington,D.C., Philadelphia, Baltimore, Portland (ME) and other points nationwide. Amtrak trains depart from South Station (Red Line), Back BayStation (Orange Line) and North Station (Green and/or Orange Line). Created with business travelers in mind, Amtrak's high-speed train Acela provides fast service along the Northeast Corridor High-Speed Rail between Washington, New York and Boston. Traveling at speeds up to 150 miles per hour, each Acela is fully equipped with power outlets and audio entertainment in-seat, bistro cars, elegant first-class cars, wide seats, conference and meeting areas and other amenities. Boston Logan International Airport (BOS) is three miles away. Airport is accessible via a taxi for an average of $20 or via the MBTA Silver Line “T” at no charge. The hotel is located on the MBTA Silver Line (a bus line used for temporary transportation and is considered part of the Subway system) at the World Trade Center stop. The Silver Line is accessed via the Red Line at South Station. Once at the World Trade Center stop, proceed 2 levels up to the Mezzanine level. The hotel is located at the end of the foot bridge on Summer Street, next door to the Boston Convention and Exhibition Center. The MBTA begins daily service Monday - Saturday at 5:35AM with the last train arriving at South Station at 1:10AM. The schedule varies on Sundays and holidays. Fare costs average between $1.70 - $2.00 per ride. The Number 7 Bus on the MBTA Bus Line stops outside the hotel on Summer Street. The bus schedule varies depending on the time of week. Monday - Saturday buses start leaving stations at 5:30AM and the last bus leaves at 10:14PM. The cost is $1.50 per trip. Whether by bus, subway, commuter rail, or ferry, you have many choices in how you choose to get around Boston. The same is true when it comes to paying for it. Charlie Card: They are reusable, durable cards that can be used for the Bus and Subway to purchase Stored Value at a discounted fare, or purchase One-Day, 7-Day, or Monthly Passes at the standard fare. Charlie cards can be purchased at many locations around Boston. Please, check the MTBA website (https://www.mbta.com/fares/charlie_card) for locations. Charlie Ticket: Charlie Tickets are paper tickets that may be used on all modes of transportation. You can get a Charlie Ticket from fare vending machines, select retail locations, and on-board most modes of transportation. mTicket app: Commuter Rail and Ferry riders can easily purchase any pass (One Way, Round Trip, 10-Ride, or Monthly) through the mTicket app. Push “activate” right before boarding and show your mTicket to the conductor upon request. Need a ride. Check out Uber for a quick and convenient option. If you want to drive, but don’t want to deal with the hassle of renting a car, Zipcar might be for you. Cost: $8 for 24 hours or $20 for a whole month. Boston is on Eastern Standard Time, five hours behind GMT and three hours ahead of Los Angeles (Pacific Time zone). The state of Massachusetts observes Daylight Savings Time. Clocks spring ahead an hour on the second Sunday in March and fall back on the first Sunday in November. Renters must be at least 21 years of age to legally rent a motor vehicle. However, renters between the age of 21 and 24 will have certain rental restrictions and depending on the rental company may have to pay a higher rate. A valid credit card is generally required to rent a car. 21 years of age with a valid photo I.D. and passport. If you order a drink, most restaurants allow free refills while you eat your meal or refills at a low cost. There is no charge for water service at restaurants. Travelers can also exchange currency at any local bank.